Canadian Contractor Enjoys Nashville Experience | Aqua-Tech Sales and Marketing Inc.
A Canadian was among the 16 contractors who enjoyed Lochinvar’s Nashville Experience, the grand prize in the company’s VIP Contractor Program. Matt Derrien of Cooper Plumbing & Heating in Calgary was treated to an all-expenses-paid trip that included a tour of Lochinvar’s headquarters in Lebanon, Tenn., and a ticket to the 2016 CMA Fest in Nashville. He also had a chance to meet with Lochinvar executives to learn about the company’s latest technologies and share his feedback. 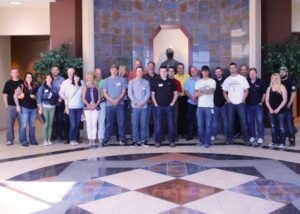 “It was a pleasure to spend quality time with our valued partners, show them around our hometown and share industry insights, all while rewarding them for their outstanding work,” said Jennifer VanHook, Lochinvar’s marketing services manager. Derrien was named a VIP Contractor in January, after he submitted a heating system he designed for a 7,000-square-foot home.